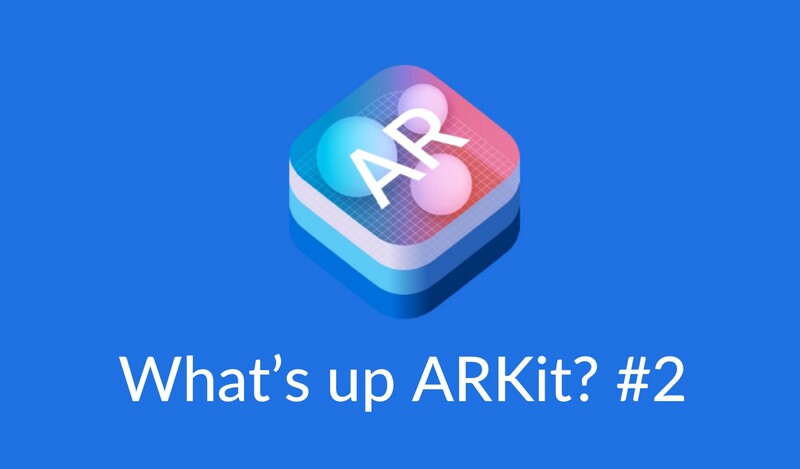 Happy to see you again around this week for this second issue of What’s Up ARKit?, this week I found more hidden links and news so that you get some insider ARKit news, let’s get into it! As always feel free to let me know your thoughts about it at @osfalmer 📩, enjoy the #2 issue! “Rumors of a standalone Apple augmented reality device have been circulating around the internet for quite some time. But beyond pure speculation, there’s actually some hard evidence that Apple is indeed developing such a device. That includes a report suggesting the company has already tapped one of its supply partners to help build out the headsets. Another Apple supplier entered into an agreement with a manufacturer of AR-related components. And Apple executives allegedly met with another supplier of AR components at CES ’18. Bloomberg has published a number of reports, citing insiders at Apple, that point toward a standalone AR device that runs on its own operating system: rOS. Reports suggest that “rOS” could have its own stable of and an App Store. This device wouldn’t need a connected iPhone to access the internet. In other words, it could function as more of a replacement for a smartphone than an accessory wearable. Based on the current evidence, this device could be more akin to an actual pair of eyeglasses than any existing VR headset on the market. It’s also worth venturing that it would look more like an actual pair of glasses than the ill-fated Google Glass project. These reports were also corroborated by a CNET story in April, which suggested that the wearable could actually be a “mixed-reality device” — with support for both augmented and virtual reality. “But one of the special sauce bits that Apple is adding to the mix of mapping tools is a full-on point cloud that maps in 3D the world around the mapping van. This allows them all kinds of opportunities to better understand what items are street signs (retro-reflective rectangular object about 15 feet off the ground? Probably a street sign) or stop signs or speed limit signs. It seems like it also could enable positioning of navigation arrows in 3D space for AR navigation, but Apple declined to comment on “any future plans” for such things. Apple also uses semantic segmentation and Deep Lambertian Networks to analyze the point cloud coupled with the image data captured by the car and from high-resolution satellites in sync. This allows 3D identification of objects, signs, lanes of traffic and buildings and separation into categories that can be highlighted for easy discovery. Thanks to Andrew Hart for sharing the info. You can subscribe here to get developer access as soon as possible: access. Nathan Gitter (@nathangitter) just showed how AR could let us explore every single aspect of a single art piece, impressive work! Check out this very nice demo of an Experience with an iPhone box by Meng To (@mengto), the renowned creator of Design+Code. Tony Morales (@robomex) just showed off how we could AdBlock all the ads we see in real life by covering them with videos/contents that we enjoy and choose. Niantic, the company behind Pokemon GO, just acqui-hired Matrix Mill and just showed off a very impressive example of occlusion on ARKit. Mohammed Ibrahim (@mohams2001) just published a tutorial about 3D Objects scanning. It seems like not everyone succeeds to actually use USDZ in the current beta versions but in this forum post people succeeded to find some different possibilities to have an USDZ file. This is the simple command but you can look in details at the link. Sandra Calvo (@sandracalvom), from IBM, taught Watson Visual Recoznition her face and then used CoreML + ARKit to build an app that shows informations about her in real time. Sandra posted the source code right here -> Thank you Sandra! There has not been any special AR app released this week so I am going to feature a very nice one released a little while ago that is really well made in the Education category. Free Rivers allows you to place interactive models of real locations like the Himalayas, the African savannah and southeast Asian deltas. You can even take control, with options to create dams to properly manage water. Is ARKit not also about having some fun? Check this out, I bet you’ll smile! If you liked this article, click and hold 👏 below so others will see it.